Titan 30 is an innovative waste solution with a patented, hygienic compaction system. 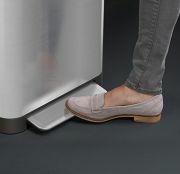 This allows it to hold up to three times more than a similar-sized household bin. Compacting your rubbish means you empty your bin less and use fewer liners. Titan also features an anti-tear design that won’t stretch or pinch the liner and a replaceable odour filter to neutralise any unpleasant smells. 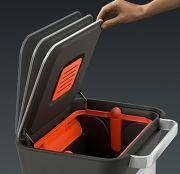 Titan’s patented design ensures only the inside of the plastic liner touches the trash whilst compacting, leaving you with clean hands and a clean bin! 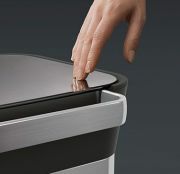 Titan’s anti-tear design won’t stretch or pinch the liner. 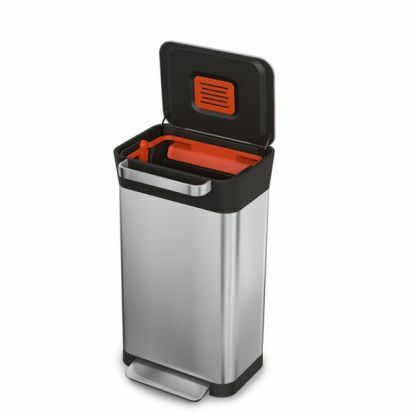 It’s compatible with standard plastic liners and also features an integrated odour filter compartment inside its lid which holds replaceable filters. Titan’s compaction system and foot pedal have been tested over 100,000 times to ensure they not only perform beautifully, but also give many years of service.